· Mr Serge GUILLAUME, Pascal HECQUET, Claude LEFRANC, Jacques FAUVEAU, Jacky OBERT and Jean Yves REGUER. 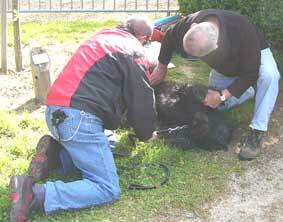 · to present a dog in the T.A.N, (Natural Aptitude Test) no diploma is required. · to present a dog in the TEST of CHARACTER, he must have earned the CSAU. Certificate of Sociability and Trainability. 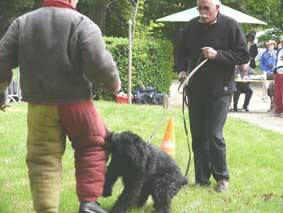 It is delivered by a judge of work of the French Central Canine Society: the SCC. Procedures for the Performance of the Tests: T.A.N and TEST of CHARACTER. There are two tests of sociability. Verification of the tattoo. 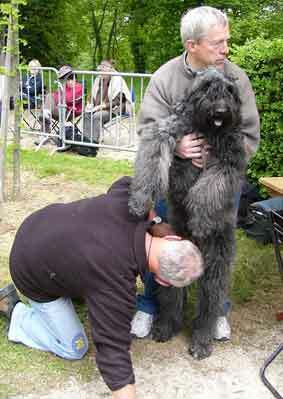 At the time of the verification of the tattoo the dog must not be aggressive (elimination), nor worried (postponement). 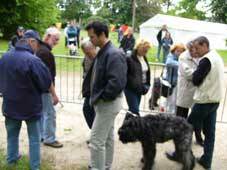 The candidate heads with his/her dog on a loose leash, toward a group of 6 to 8 immobile people through which he passes quietly. 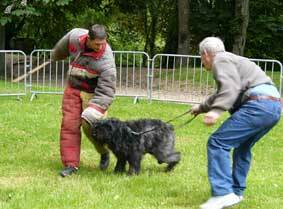 Leaving to a distance of 2 to 3 meters out of the group, the handler turns back and re-enters the group, whose members are now moving all around the dog as per the directions of the test judge. The judge will ask some group members to pet the dog. If the dog shows aggression it is eliminated. If the dog shows worry, it is postponed. if the dog does a 5 second bite on the decoy who struggles without making use of his/her stick, he is awarded the Test of Character, provided that he succeeded all other tests. For the TAN a line is drawn to indicate the place where the team of dog and handler must remain in place to face the same level of decoy aggression as previously described. If the dog, without having the possibility to bite, interferes to try to dissuade the aggressor, he gets the TAN, provided that he succeeded in all other tests. The decoy having made U turn, returns to his hiding place. The dog is allowed to relax and stand there, without physical contact with his/her master and a shot is pulled without provocation. In case of aggressiveness the test-judge heads in a friendly way toward the dog until his/her/its contact to ascertain the stability of the character.